Give your BMW Z3 roadster or coupe a refreshed look with NEW floor mats or a trunk mat. Nothing looks as good as a new set of custom-fit, embroidered, OEM BMW floor mats. Premier Custom BMW Z3 Floor Mats. Custom fit heavy duty cut nylon pile carpet. Set of 2 front mats (no grommets included). This will fit all models for years 2000 - 2002 only. 100% durable with a thick, plush feeling. These floor mats have better coverage than most original mats and are WASHABLE! Sturdy vinyl nibbed backing keeps them in place. Premier Custom BMW Z3 Floor Mats are available in the following colors: Beige, Black, Caramel, Driftwood, Evergreen, Gray, Gray Mist, Navy, Smoke, Taupe and Wine. Previews of the available colors can be found by clicking on the underlined BMW Z3 (2000-2002) Premier Custom Floor Mats link next to the picture above. Premier Custom BMW Z3 Floor Mats. Custom fit heavy duty cut nylon pile carpet. 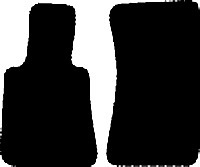 Set of 2 front mats (no grommets included). This will fit all models for years 1996 - 1999 only. 100% durable with a thick, plush feeling. These floor mats have better coverage than most original mats and are WASHABLE! Sturdy vinyl nibbed backing keeps them in place. Premier Custom BMW Z3 Floor Mats are available in the following colors: Beige, Black, Caramel, Driftwood, Evergreen, Gray, Gray Mist, Navy, Smoke, Taupe and Wine. Previews of the available colors can be found by clicking on the underlined BMW Z3 (1996-1999) Premier Custom Floor Mats link next to the picture above. This official BMW carpeted trunk mat is a great way to give a touch of class to your trunk. 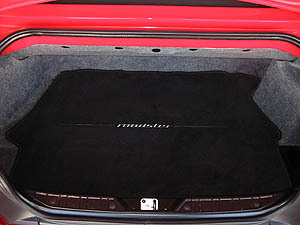 The carpeted roadster trunk mat has an embroidered "roadster" logo. 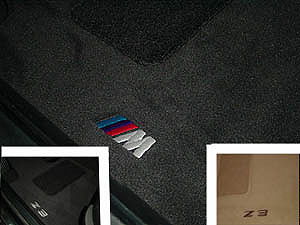 The coupe mat has an embroidered "///M" logo. Select model on checkout. CLICK on the picture or title to view fitment in the Z3 roadster.